From the creators of last years collaboration- THE POLLOCK PROJECT comes the second installment with the partnership of The Mennello Museum of American Art and Beth Marshall Presents. The 1934 PROJECT is an original piece marrying visual art, performance art, theatre and history with an innovative take on the artistic “Works Progress” movement during 1934. The show takes place in the Museum in their exhibit room featuring the 1934: A New Deal For Artists works. The audience experiences an intimate explosion of art in many forms. exhibition recognizes the seventy-fifth anniversary of the federal Public Works of Art Project. 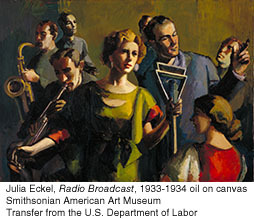 Lasting only six months, from mid-December 1933 to June 1934, the New Deal program employed artists during the Great Depression and encouraged them to depict the American Scene. Drawing on the American Art Museum/s unparalleled collection of paintings, this exhibition highlights fifty-six works ranging from portraits and city scenes to landscapes and images of rural life. Created by artists from across the United States, the paintings are a lasting record of America at a specifictime and embody the countries hope for a brighter future.